Use our lesson plan to help introduce students to coral reef ecosystems. 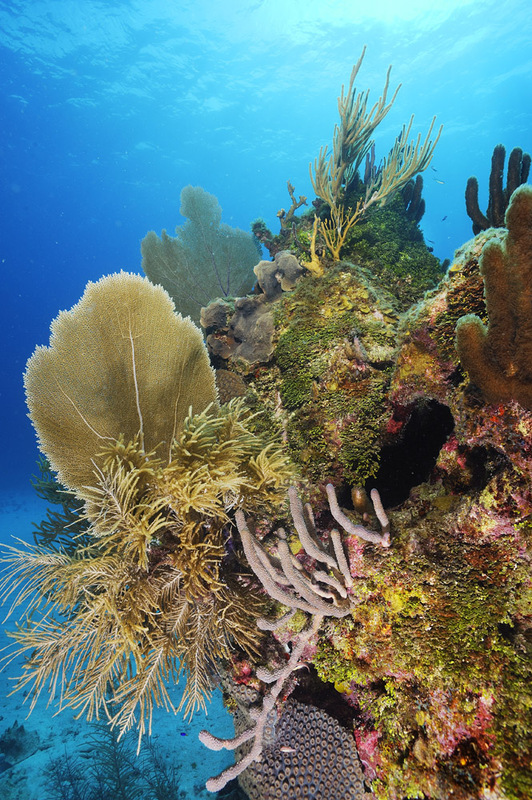 Look at this beautiful, healthy coral reef off the coast of the Swan Islands of Honduras. Look at this beautiful, healthy coral reef off the coast of Australia. New research indicates our bias toward pretty pictures may influence our perception of coral reefs. What are coral reefs? Coral reefs are incredibly biodiverse ecosystems made up of multicolored limestone ridges built by tiny sea animals called corals. The corals’ hard exoskeletons are what make up coral reefs. The ecosystem benefits provided by coral reefs rely largely on their dazzling colors. Why are corals so colorful? They’re not, really. Corals and their exoskeletons are actually clear or translucent. Corals can synthesize pigments. These pigments benefit a type of algae known as zooxanthellae. Zooxanthellae live inside the coral, and have a mutualistic relationship with their host organism. “The coral provides the algae with a protected environment and compounds they need for photosynthesis. In return, the algae produce oxygen and help the coral to remove wastes. Most importantly, zooxanthellae supply the coral with glucose, glycerol, and amino acids, which are the products of photosynthesis. The coral uses these products to make proteins, fats, and carbohydrates, and produce calcium carbonate” to make their exoskeletons. 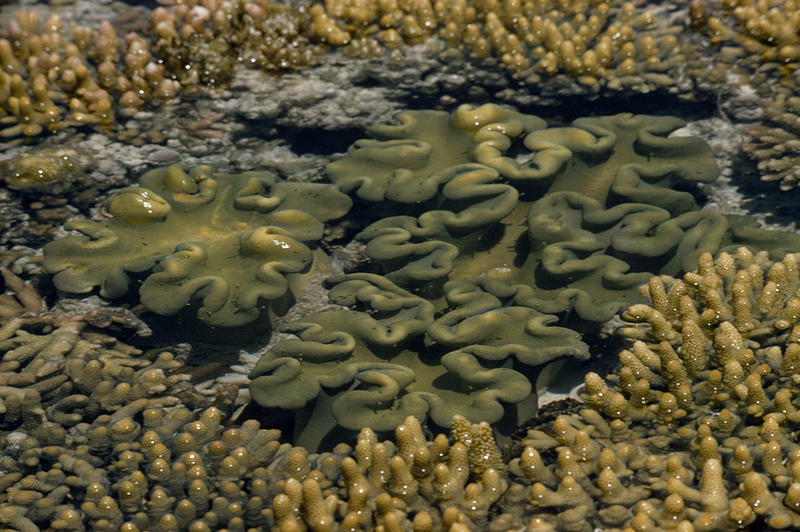 Photosynthesizing zooxanthellae lend corals their brown and dark-green colors. Corals’ brightly colored pigments protect zooxanthellae by acting as sunscreen and shielding the algae from harmful UV rays. Deep-water corals, less dependent on pigments, are usually greyish, brownish, or white. Coral reef coloration is dependent on genetics. The production of pigments is a complex, energy-intensive process involving multiple copies of one gene. The process may vary radically across corals exposed to the same light and environmental conditions. Why is it “unrealistic” to expect a healthy coral reef to be colorful? Photographers and filmmakers frequently only show the most colorful coral reefs, leading to the popular assumption that all healthy reefs are colorful. They’re not—healthy reefs may be greenish, yellowish, or brownish. Why is the appearance of a healthy reef possibly as important an actually healthy reef? Both the tourism industry and conservation organizations benefit from beauty. Visitors and donors are more likely to value “unhealthy and beautiful” reefs over “healthy and less-beautiful” ones. When corals are stressed (often due to ocean acidification), they can no longer divert energy to supporting zooxanthellae, and expel their algae partner. These “coral bleaching” events are signs of an unhealthy ecosystem: without algae, the corals lose a major source of nutrients are more susceptible to disease. How can you tell the difference between an uncolorful reef that has undergone a bleaching event and an uncolorful “healthy and less-beautiful” reef? Take a look at this guide from EcoMar for some help. Healthy corals are consistently olive green, brownish, and pale yellow. The waters surrounding healthy coral reefs are rich in biodiversity; just take a look at our downloadable illustrations for a peek at a coral reef food web. Fish, plankton, sea turtles, fish, snails, sea stars, crustaceans, marine mammals, worms, shrimp, clams, seagrass, and sponges are just a few of the organisms that may be found in a healthy coral reef ecosystem. Bleached corals are white, although the reef as a whole is often inconsistently colored. In fact, a smatter of “[b]right coloring is common in the early stages of a bleaching event.” A reef that has undergone a bleaching event does not support a food web. NOAA: Zooxanthellae … What’s That? Previous Previous post: 10 Ways to Beat Plastic Pollution!